Two things I’ve never yet found time to add to the site: my long-rumored Tree Circle Photo Gallery, and a similar photo gallery of a small handful of the no-doubt millions of ersatz wishing wells besmirching homeowner’s yards from Maine to California. My fault, of course. It would be easy. I shoot photos of barren, abandoned wishing wells slowly falling apart on lawns all the time. I have nothing against the addition of a wishing well to the landscape per se. Yes, I would prefer that were one to flip a quarter into the thing, there would be a few seconds of silence before one heard a faint splash of water, but still, if you want to add a decorative, fake wishing well to your property, be my guest. But design its placement into the landscape. 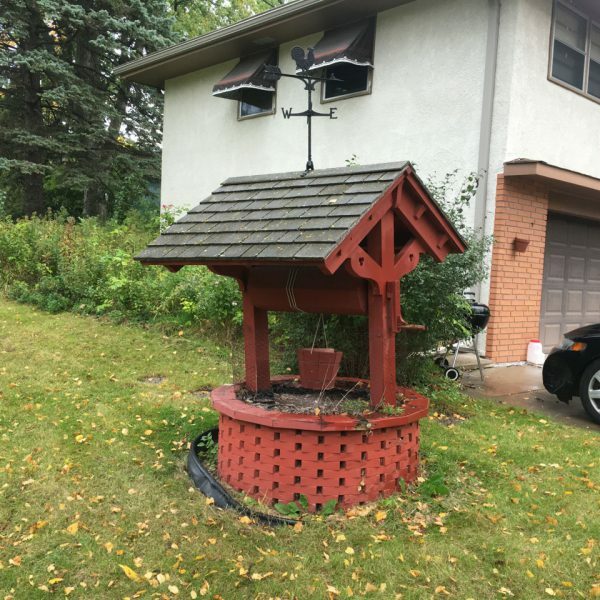 Sticking a wishing well out in the lawn is exactly what I’m talking about when I say that homeowners, when it comes to landscape design, think too small. Beginners cut a circle in the lawn and fill it with flowers, then they circle a grand oak with daylilies, then they plunk down a wishing well over there. There is no flow, no continuity, just this hodgepodge of various meager gardening endeavors dotting the property in an unrelated fashion. If you add a wishing well—and please, anything but white plastic—stick it along the edge of a landscaped bed that curves along your property’s perimeter, or in a large island bed featuring a graceful small tree and some really neat shrubs, or in a sweeping foundation bed that rises and roils out away from the side of your house. I wish I had a photo of mine of a properly landscaped placement of a wishing well to show you, but I’ve never seen one.